The scene on the highway’s exit ramp caught me off guard. A stout woman, in her sixties perhaps, with glasses and frizzy brown hair, dressed in sneakers, jeans, and a sweat-shirt, stood near her parked truck, transfixed by something in the grass. Bicycling closer, I noticed she was Native American and the object of her attention was a bird plump as a chicken and glossy as obsidian. Fascinated by all wildlife and fond of aerobatic corvids clowns in particular, I stopped on the gravel shoulder. The raven’s left wing dragged; feather tips skimmed the grass. The chisel bill hung ajar, as if its owner were panting, displaying the mouth’s soft lining. With each blink, white nictitating membranes closed on the bird’s eyeballs like camera apertures freeze-framing the world. I asked if she needed a hand, and she went to the truck, returning with a sweatshirt. Noon sun ironed my back, undeterred by clouds like gray paunches that sagged toward the horizon. As cars sped by, curiosity flickered across the drivers’ faces. Oblivious to the streaking of traffic and pain, the bird focused on the more imminent threat we represented. Each time the woman approached, it hopped beyond reach, tucking the hurt wing close to its body, as a person would a dislocated arm. Circling around, I distracted it long enough for the woman to throw the shirt over it. She stooped, nimbly for somebody so compact, and scooped up the raven before it could wiggle free. We walked to her truck and I opened the door. I wedged my bike and backpack full of groceries into the truck and got in. En route to the opposite end of town, she rang a friend who had worked in bird rehabilitation. She already had called that friend for advice as soon as she spotted the bird. Through fabric my fingertips sensed the bird’s heart. Unable to tell terror from resignation, I listened to its labored breathing, worried that it might suffocate or overheat. A scaly leather foot, tipped with lacquered claws, had escaped from the wrap, and pressed against my belly. Occasionally, as frost heaves or cracks in the pavement shook the truck, wings brushed against my breastbone like spruce boughs or a book page. I had never been that close to a raven before. My grandmotherly accomplice, Margaret, recalled how she had trapped a raven by accident when she still lived in her village up north. She had been setting snares to catch rabbits; to her surprise a raven stepped into one of her loops. She released it and, getting stabbed in the process, came to respect the bird’s moxie and imposing bill. Research for a school paper she had to write turned up little scientific information about corvid-human interaction, but Margaret unearthed a wealth of raven lore, knowledge rooted deeply in time, accounts and beliefs that branched far beyond North America into Siberia and Europe. She could have learned about charcoal sketches in the caves near Lascaux that depict corvids and imply their importance to early humans as messengers or even as human souls. Or that, in Norse mythology, two ravens named Thought and Memory perched on Odin’s shoulders, gleaning news of the world on daily excursions. And that without stars to guide them through summer’s nacreous midnights, Norse settlers released hrafnar and trailed the black scouts landward in their single-mast ships. 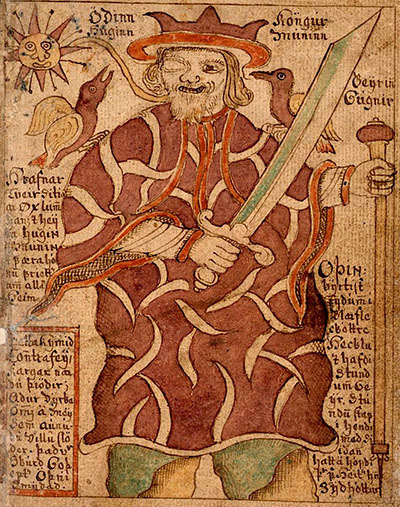 Illustration from an 18th-century Icelandic manuscript depicting Huginn and Muninn sitting on the shoulders of Odin. Courtesy of Árni Magnússon Institute, Iceland / Wikimedia Commons. Throughout the northern hemisphere this bird attended shamanistic flights of trance. It was teacher and totemic ancestor. It stared bug-eyed from the limbs of family trees along the Pacific Northwest coast, populating genealogies hewn into cedar trunks. 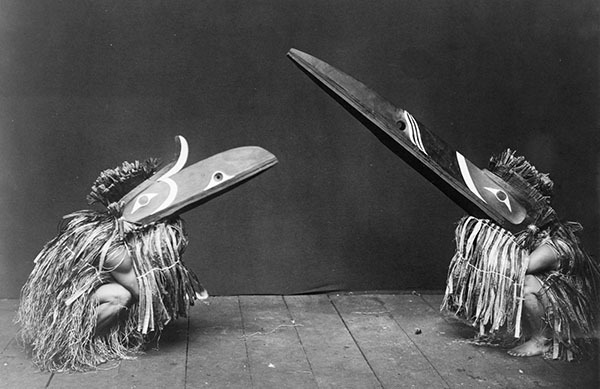 Kwakiutl dancers acknowledged the bond by wearing masks with four-foot-long bills that closed with whip crack sounds. Crow-walking under the spell of gourd rattles, they became birds. Other raven masks split like seedpods, revealing a second mask and thus the deception of first impressions, the hidden nature of things. In the mythology of Margaret’s own people, the Gwich’in of the Yukon and northeast Alaska, Raven acted as trickster and transformer. In the course of his exploits, he often suffered violence or deformity, comparable to the bird I was cradling. Vulgar and petty, scheming and greedy and often not very smart, he embodied the sacred and the profane, the light and the shadow inside each one of us. At the beginning of “Distant Time,” he created not only humans, but also animals, some of which looked after people as guardian spirits. As part of a bargain between species, people honored obligations, obeyed unwritten rules, and offered gestures of attentiveness, feeding dried fish to a wolf they had killed, or not disturbing a raven on its nest, lest the weather would turn cold. In a mythical age that for believers is present to the same degree that it is past, Raven stole daylight for his creations, which until then scrambled around in the dark. Inspired perhaps by the bird’s love for shiny objects or by a solar eclipse, one tale told around midwinter fires recounts Raven’s theft of the sun. A chief in the sky had given the orb to his child as a toy. When the toddler dropped it and it rolled into the room’s corner, Raven covered its glow with his wing. Then he flew back to earth with it, illuminating the world of people. His benevolence is believed to assume the form of actual ravens that guide hunters to fresh wolf kills, moose or caribou, the bounty of which feeds entire families. Villagers in Alaska pay close attention to the living environment, and a raven rolling onto its back in midair is “dropping a package of meat,” announcing good fortune for the observant. I told a few anecdotes of my own. On a snowy Fairbanks sidewalk I once found evidence of a raven meal: a scuffle of rune prints, banded feathers, and at the display’s center a grouse foot. During a Grand Canyon trip, fat twin marauders in search of food hacked into my backpack and pulled out smelly socks. (I had been mad enough to fling rocks at them.) Similarly, a mile above timberline on Denali’s buttressed heights, ravens had made the connection between bamboo wand markers and the food caches climbers left in a snowdrift, excavating peanuts, cheese, and beef jerky with great gusto. While many climbers consider them flying rats, many other Alaskans, like myself, have a soft spot for them. In downtown Sitka, I saw car drivers wait patiently for ravens to grab a meal on rain-slicked Harbor Drive instead of honking their horns or trying to squeeze by or to run over them. As our conversation progressed, Margaret and I realized we had common acquaintances in a city of seventy thousand that can be as tight as a village, among them my former Native-language teacher. Our conversation, which had begun as a trickle, meandered from the invalid bird to its kin until the current widened, roiling raw stuff to the surface. Between raven stories nestled Margaret’s confession that she was a recovering alcoholic. She hinted at divorce, at a step- or adoptive parent. Her children and grandchildren lived as far away as Tucson, and she rarely saw them. Beadworking had given her strength to pull through. “It keeps my hands and mind busy all the time,” she told me. She talked about her style, how she kept seeing images and patterns in nature, which she then translated into art. Craft and expertise ran strong in Margaret’s family. Her mother had passed on the gift; at age fourteen, she had fashioned a fringed, shell-and-bead-encrusted hide shirt for Margaret’s great-grandfather, a chief. It now hung in a display case at the university museum on the hill above town—a snippet of culture enshrined. When we finally reached the clinic, the raven felt heavy and warm, like a swaddled, if damaged, foundling. The bird’s weight on my belly released feelings that, for a non-pet person sworn to childlessness, welled up unexpectedly. I imagined how easily an observer could have mistaken our trio for a family rushing its infant to an emergency room. There was an entrance for dogs and another for cats, but none for birds. We stood in the air-conditioned office’s neon glare, with sterile surfaces and posters that advertised pet health care. I sweated where the cotton bundle touched my body. Margaret tugged on her T-shirt, admitting coolness to her skin. While a receptionist had her fill out some paperwork, my arms tired and I braced them on the Formica counter. The bird squirmed again and let out a rusty squawk; I tried to keep a good grip, mindful not to break feathers or injure it even more. Before long, a veterinarian’s assistant took it into another room. She returned to hand Margaret her soiled sweatshirt. “I’ll have to wash this,” Margaret said calmly. “What will become of the bird?” I asked the receptionist before we left. Back at the truck, Margaret volunteered to drive me home. On the way there, we talked some more. I wondered aloud if it was even legal to pick up or keep wildlife. “Let ’em come find me, if they want,” was all she said. Before I stepped from the truck, Margaret showed me photos of her traditional yet innovative beadwork, paraphernalia of many-hued glass that she sold at church bazaars: garlands offsetting inspirational poems, necklaces culminating in bear pendants, tanned-hide discs blushing with floral designs, and wall hangings embroidered with the sign of her people’s adopted faith. I asked for her phone number in case I ever needed a customized gift. I intended to let Margaret know the outcome of our rescue mission, but, for personal reasons, I also needed to follow this story to its end. At the time, my writing, if not my curiosity, had almost ground to a halt. The world did not seem to provide any new plots. Words did not come easily anymore and, when they did, mimicked flowers pressed in a book more than the green fertile mess that threatened to swallow my yard. But the minute I closed the cabin door, I grabbed pen and paper, and sentences began to form. The next day, I rang the clinic to inquire about the patient’s condition. The diagnosis was bleak and the outlook even more so. As the result of heavy trauma, typically caused by collisions with cars or windowpanes, the raven had broken a wing bone and dislocated a shoulder and would never fly again. It shared the fate of many residents-turned-trespassers, an opportunistic lot that includes ants, magpies, rats, coyotes, deer, and here in Alaska, gray jays, bald eagles, and bears. Often lacking familiarity with technology’s traps, as well as the luck to dodge development, these camp followers glean from our tables, our henhouses, our backyards, our interstates. We’ve created predator-free havens filled with tidbits and trash, and they flock to them. An attentive observer can witness a trick bag of raven slyness outside of supermarkets, or marvel at how they dive into greasy Dumpsters, haggle over scraps, or, heads cocked sideways, gauge the speed of traffic before dashing onto asphalt to peel off mangled rabbit flesh. Such scavenging devalues them in the eyes of some people who regard them as vermin. But is the ravens’ defiance of human plans and conventions not a kind of wildness? Some creatures become so familiar that our perception of them dulls. They blend into the landscape as if plumage or fur were a camouflage coat. When we do take notice, we sometimes label them “common” or consider them vulgar, but there is nothing common about this rogue bird, except for its manners. Of all my wild neighbors, it is the one that seems the most human. At Prudhoe Bay’s oil fields, ravens begin to nest in late March, at minus thirty degrees. With no twigs free of snow, they requisition unusual nest-building material: welding rods, plastic cable ties, copper wires, survey stakes. Some assemble to meet incoming cargo, waiting at the airstrip for the plane’s arrival. During the unloading, they raid food crates, rip open the packaging, and sometimes hide loot in industrial structures, away from patrolling foxes. As soon as the snow melts, they waddle after lemmings; they pilfer eggs and chicks from migratory birds. They mostly ignore oil field workers but will avoid a researcher who previously trapped them, recognizing the enemy even when she wears borrowed coveralls and a hard hat in disguise. Ravens handle cold snaps of minus fifty degrees or below far better than they do cars. Their physiology enables them to prosper anywhere between the Sonoran Desert and the Arctic Ocean. Reminiscent of Raven’s mythic coup, they capture minute amounts of sunlight with their dark, absorbent plumage and fluffed up retain precious body heat. Sheer size, combined with stockiness, helps these largest of passerines to preserve life under winter’s harsh cloak. On clear winter days, you can surprise ravens with spread wings that are sunbathing on the ground or rolling exuberantly in heavenly down. If you sit still enough, long enough, in a Fairbanks parking lot, vignettes of urban raven life will accumulate: Seven birds aligned on the back of a truck, eyeing its garbage-strewn bed and clucking at the sudden bonanza. A pair locked together in midair, tumbling tails-over-heads, scattering feathers as if in a pillow fight. A scruffy loner extracting ketchup packets from a plastic bag, stashing them in snow piled around the foot of a parking meter for future consumption. They live like street bums or heroes fallen from grace; some people take this as a sign that the ancient spirits no longer care for their animal manifestations. But not me. Fledged under Alaska’s raw skies, the birds still belong more in this place than I, a transplant from afar. In Distant Time stories, Raven as the trickster and culture hero often tripped over his own appetites. Left alone, its descendant, the specimen Margaret and I had brought into the clinic, also was likely to meet a bad end. Without the use of a wing, it would starve or fall to the next predator crossing its path. The vet was still trying to contact the only qualified bird rehabilitator in town. If that person could not give it refuge, the raven would be euthanized. Appalled by the news, I wanted to take it home but discovered I needed a permit and an appropriate setup for keeping a wild animal. The vet refused to free the bird and, detecting my frustration with clinic protocol, reminded me that I had interfered with nature’s workings when I helped retrieve it. But, I wanted to shout into the phone, I’d stepped in only because our kind caused the accident in the first place. I called again the following day, a Sunday. The receptionist kept me in a limbo of Muzak laced with commercials. When she came back on the line, she informed me that the bird had been put down. I pictured the vet thrusting a syringe through the iridescent mantle into warm flesh I had held. As jet black button eyes lost their luster, I wished for one less story to tell. When I phoned Margaret at work the next morning, she had already heard about the mercy killing. “Too bad,” she said while I gripped the receiver. Regret and compassion colored her voice, and an entire people’s weight rested upon those two words. 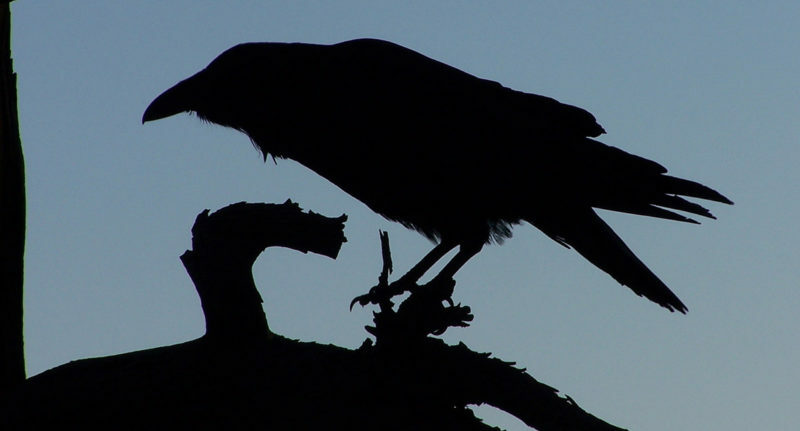 Header image – Raven at Dawn. Photo by Bryant Olsen, courtesy of Wikimedia Commons.